Allegations of domestic violence against Sen. Sherrod Brown (D., Ohio) may complicate his critique of Republicans for waging a "war on women" and have a major impact on his re-election race against Republican challenger Josh Mandel, experts tell the Washington Free Beacon. Brown has strongly supported reauthorization of the Violence Against Women Act (VAWA), which passed the U.S. Senate April 26 and now awaits a vote in the U.S. House. The reauthorization includes new protections for undocumented immigrants as well as gay and transgender persons. Brown cited the more than 38,000 incidents of domestic violence in Ohio last year in stating his support for the bill. He also said the bill would help law enforcement agencies to better "hold perpetrators accountable." Brown’s campaign has attacked Mandel for supporting a "clean reauthorization" of VAWA, without the new provisions. Mandel’s campaign has accused Brown of trying to "politicize this important piece of legislation." But Brown’s maneuvers may backfire in light of his own personal scandals, experts say. Court documents show that Brown was accused of assaulting his ex-wife Larke Ummel Brown and acting cruelly toward her and the couple’s two small children. "Plaintiff further states that Defendant has been guilty of gross neglect of duty and extreme cruelty toward her, by reason of which Plaintiff is entitled to an absolute divorce." "I am also intimidated by the Defendant and am in fear for the safety and well-being of myself and our children due to the Defendant’s physical violence and abusive nature," Larke Brown wrote in her affidavit requesting a restraining order, dated May 12, 1986. Sherrod Brown disputed his wife’s claims, saying in his counterclaim for divorce, dated June 10, 1986, that he "has never been abusive or violent with Wife or anyone else." The seven-count restraining order barred Sherrod Brown from harassing Larke in person or over the phone, selling or disposing of the couple’s assets, changing beneficiaries or cashing out life insurance policies on Larke or their children, and from "coming in or around the Plaintiff’s residence … except for purposes of visitation with the parties’ minor children." "[Brown] refused to return to the car, pushed me up against the wall with his arms in order to pass and entered the house. He refused to leave and began to say insulting, derogatory things about me, my mothering of the children and my character in front of my friends and the children … [Brown] then cornered one of my friends … and again started on his tirade of character assassination. … [I] felt physically threatened because of [Brown’s] combative tone and his assault on [me] at the entrance to the house." "He has struck and bullied me on several different occasions, he has completely destroyed my peace of mind and I am extremely intimidated by him … [Brown] has embarked on a course of conduct designed to destroy the children’s peace of mind by making slanderous and defamatory remarks about [me] to them, as well as insisting that they repeat untruthful things that [Brown] had coached them to state." The restraining order was dropped in January 1987 when the two parties agreed to settle the divorce, according to court documents. "If Sen. Brown has something like this in his past, then it makes perfect sense why he would be advocating so hard for the Act’s reauthorization. I would characterize that as hypocrisy," said Christina Villegas, a visiting fellow at the Independent Women’s Forum. "Because of the politics of the domestic violence issue, and because the name of the law implies a good intention for it, politicians are afraid of questioning the unintended consequences of the new provisions of the Violence Against Women Act," added Villegas. "They’re afraid of being labeled ‘anti-woman.’"
Brown lost his 1990 reelection race for secretary of state in what one Democratic operative called "one of the filthiest, dirtiest campaigns I’ve ever seen in my life." But Brown did not face public criticism for his alleged conduct toward Larke until his first U.S. congressional campaign in 1992. Brown’s Republican opponent Margaret Mueller ran radio and television ads—against Larke’s stated wishes—featuring a dramatic reading of Larke’s statements from the case. Brown won the election by 46,000 votes. "In most cases if the opponent—in this case Mandel—can make a credible argument that something from the incumbent’s past should have disqualified him from public office in the first place, then he might get traction with that," said Geoff Skelley, a media coordinator at the University of Virginia Center for Politics. "It’s hit-or-miss, but Brown has already gone negative on Mandel, and vice versa. With six months left in the race, it might help for the Mandel campaign to throw it out there and see what sticks," Skelley said. "With Senate campaigns starting earlier and earlier, this might be the time to put out these kinds of personal attacks. As the election gets closer, the end game for most of these races will be the economy," he said. 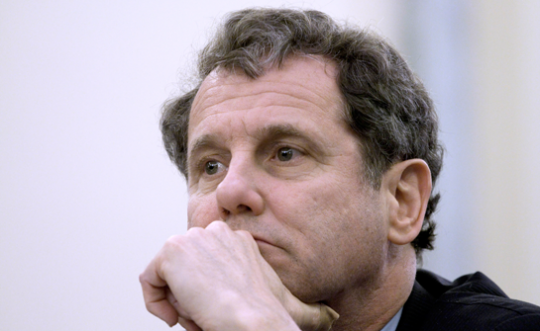 Brown’s office issued a press release in March announcing the creation of Women for Sherrod Brown, "a group of Ohioans supporting Sherrod Brown for his proven track record of standing up for Ohio’s women." Brown published a petition on his website during the recent national controversy over Obamacare’s contraceptive mandate, asking supporters to help fight the GOP war on women. "I’m standing up to the extreme right by launching this campaign against the war on women’s health and economic security. I hope you’ll sign below and join me," Brown wrote. "It’s disconcerting to me how real deliberation on the Violence Against Women Act has been overtaken by name-calling on both sides of the aisle," Villegas said. "Many politicians are more concerned about their appearances politically than about actually helping prevent domestic violence," she said. This entry was posted in Politics and tagged Congress, Josh Mandel, Sherrod Brown. Bookmark the permalink.